Lipid-based drug delivery (LBDD) systems are well suited for poorly water-soluble, lipophilic, hydrophobic APIs. LBDDs comprise single or multiple excipients, forming oily formulations, self-emulsifying (SEDDS) and self-microemulsifying (SMEDDS) formulations, and micellar solutions. They are categorized into four types on the basis of composition, dispersion, and digestion characteristics. LFCS Type I formulations consist of lipophilic ingredients (oils) that are not dispersible in aqueous media. They act as solubilizers/carriers for highly lipophilic drug molecules (high log P) in the dosage form. On digestion they contribute to the micellization of lipophilic APIs and subsequent absorption mediated by fatty acids and monoglycerides. LFCS Type II and Type III formulations are self-emulsifying systems consisting of water-miscible excipients with self-emulsifying and wetting properties. The extent of the resulting dispersions may vary depending on formulation components. Digestion of excipients leads to micellization of the lipophilic APIs and subsequent absorption mediated by fatty acids and monoglycerides. LFCS Type IV systems contain little or no oil. They are mainly composed of water-soluble surfactants and hydrophilic cosolvents, capable of forming transparent micellar solutions on contact with aqueous or GI media. These formulations generally exhibit substantial solvent capacities that can be compromised upon dilution. Depending on the composition, the formulation may or may not be digestible, which also impacts drug solubilization and absorption. Self-emulsifying lipid formulations (SELFs) form emulsions upon contact with aqueous fluids without the need for mechanical or thermal energy. The size of the dispersion depends on the composition of excipients in the formulation. High-HLB polyoxylglycerides—Labrasol® ALF, Gelucire® 44/14 and Gelucire® 50/13—are good surfactants and contain a small fraction of glycerides. Their composition is water dispersible, forming microemulsions (LFCS Type III SMEDDS) upon contact with aqueous fluid. High-HLB polyoxylethylene stearate—Gelucire® 48/16—is a pure surfactant with no glyceride fraction. It is able to form a micellar solution (LFCS Type IV formulation) upon contact with an aqueous fluid. Lower-HLB polyoxylglycerides—Labrafil® M 1944 CS and Labrafil® M 2125 CS—have a higher proportion of glycerides and a lower concentration of free PEG, and they are less soluble in water. They spontaneously form emulsions (LFCS Type II SEDDS) in aqueous fluid. In some cases, a single excipient provides sufficient solubilizing power for the entire therapeutic dose. This can be the case with oily excipients (like Maisine® CC) with highly lipophilic APIs; self-emulsifying excipients like Labrasol® ALF, Gelucire® 44/14, or Gelucire® 50/13; and micellar systems like Gelucire® 48/16. However, if two or more excipients are required to solubilize the therapeutic dose, a step-wise approach to formulation development is required: this includes miscibility assays and the construction of a ternary phase diagram. Selection of the right candidate excipients for formulation development depends on API properties and the therapeutic dose since the dosage form unit is designed to deliver the entire dose of the solubilized drug. 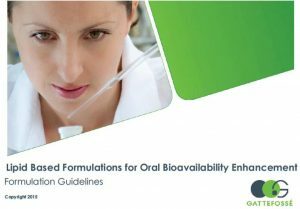 in vitro characterization, including the lipolysis assay, are described in our Guidelines for Lipid-Based Formulations for Oral Bioavailability Enhancement, available from your local Gattefossé contact. Remember: nothing beats one-to-one support in lipid-based formulation, so please don’t hesitate to contact us. 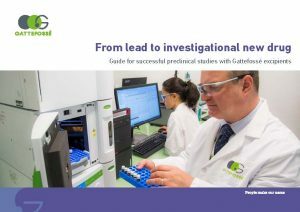 Discover our three educational webinars by Dr. Vincent Jannin, Gattefossé Pharma R&D Director and resident expert in Lipid-Based Formulation. Our lipid excipients are available as liquids, semisolids, and solids—each form requiring different handling procedures. Correct handling ensures excipient homogeneity and helps preserve quality. Excipient handling information is available from your local Gattefossé representative.